Miami Heat point guard Carlos Arroyo was arrested Friday in Coral Gables and is facing charges for a traffic violation and resisting arrest. According to the arrest report, Arroyo was spotted at 8:41 a.m. driving slow enough along the 7100 block of Old Cutler Road to the point that he was said to be impeding traffic. Arroyo apparently was on his way to the Heat’s practice at AmericanAirlines Arena. He did not attend the workout in advance of Saturday’s game against Milwaukee. “We are aware of the traffic stop involving Carlos Arroyo this morning, and while we fully support our players, this is a pending legal matter and we will have no comment at this time,” Heat president Pat Riley said in a statement. According to the incident report, a motorcycle patrolman made several attempts to stop Arroyo’s vehicle. Additional police units were called because of Arroyo’s initial unwillingness to pull over his car, according to the incident report. Arroyo, 30, eventually stopped but “attempted to resist” being handcuffed when he exited his car. He was also accused of being “confrontational and challenging” and “posing a threat to both himself and officers,” the report said. 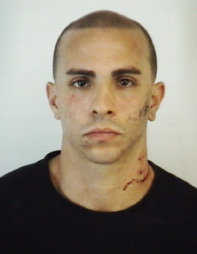 Arroyo appears to have scratches and red marks on his face and neck in a mug shot taken by police when he was booked at the Coral Gables Police Department. He is charged with operating a vehicle at a low enough speed to impede traffic, resisting arrest without violence and failing to obey a lawful order. Arroyo was released on a promising to appear in court. Resisting police without violence? Then why those cuts to his face? I have a very low opinion of South Florida law enforcement. They don’t believe the law applies to them, and I cite multiple instances that say just that. Plus my own personal experience of getting harassed by five to six policemen and almost arrested. My crime? Waving down an officer when my car broke down. Right now Arroyo has my sympathy.